At the age 3, in desperation at my wiggliness, my Czech grandmother taught me to embroider. I’ve been hooked on all kinds of crafts since then and have taught them, too, since my teen years. 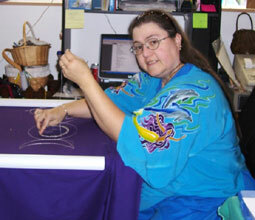 I spent 15 years as an SCA merchant (Society for Creative Anachronism) selling my blackwork embroidery patterns (Mab’s Creations) and other products, such as period toys and music. I’m not sure if he’s a Wiz with a crystal ball or a whiz, but this is Tempus, the incredible invisible husband who channels from the Pun Plane! He’s been the quiet motive force behind all the repairs and re-dos at the shop in 2009 (once the bookshelf got finished) from getting the Roomba to work again, to the drip irrigation system that is watering the flowers. Since his major interests are astrology and alchemy, he’s intending to take over the incense making and may actually get the Ancient Light brand cone and “plotz” incense underway. He’s also been encouraging Anja to make costumes for the Roomba. . . Uh-oh. . . Ancient Light is the covenstead for this group that started in 2004. 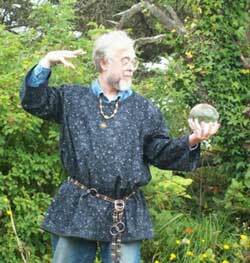 We sponsor OCPPG (the Oregon Coast Pan-Pagan Gathering) every fall and have classes in Wicca (among other things) on a regular basis. Grandma Helen, my mother, loved living on the Oregon Coast. She moved out here from Maryland, where she had lived her whole life, until as she put it, she, “Hit the Oregon Trail” in her 80th year to come live with our family in her last years. She was here when this whole thing started and loaned us the seed money to get the shop going in the first place. I had some stock and the know-how. Tempus had the business experience. She had the encouragement and was the backup that we needed to finally create the “brick and board” store that we had been contemplating for so very long. Sadly, her doctor’s diagnosis of “tomorrow or 10 years, but it won’t be more” happened on Beltane Eve of 2008, but you never know when she’s going to comment on someone’s grammar, even yet! 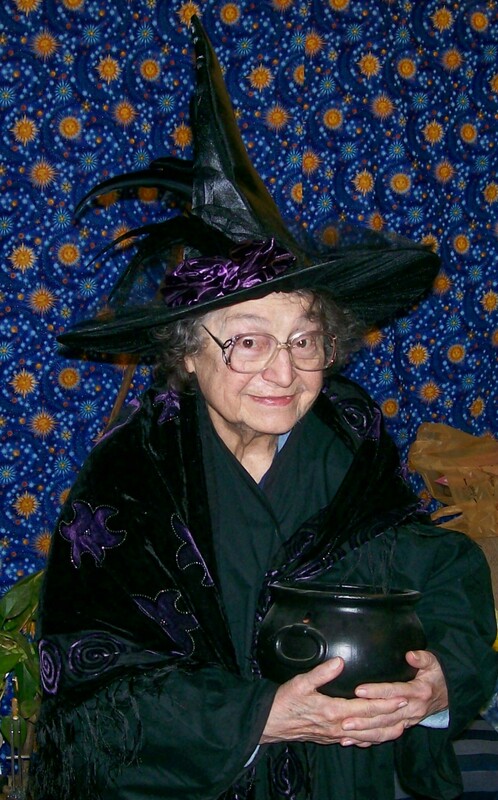 The shop library is her memorial, as her life-long commitment was to teaching and education. I used to put in the shop ads, “…and don’t forget to say hi to Grandma!” as the tagline, as she loved getting to talk to people at the shop, even if once in a while she said some really hilarious things as her hearing and memory deteriorated! We miss her. …and this was one of her favorite pictures of herself, featured on the shop’s Samhain card. where do I send info response re pan pagan? Best would be on Facebook in the OCPPG group. You can still reply in the Yahoo group or by e-mail. “Snail is a reflection of the protective spirits that surround each of us. The appearance of a Snail totem in your life reflects the need to be more protective in your environment. Be aware of your surroundings and keep your guard up. Think about where you encountered Snail – on the way to work? Near home? Call upon your spirit protectors as you walk around the place where you encountered Snail. Snail people are often loners, not very social and often timid. Their life lesson will be to learn to trust. Learning to balance trust and protection is a difficult lesson;watch out for the appearance of Snail and back off when he appears. Actually I got the elk picture on the way to Medford. I live out on the coast, yes, but a long ways up from Crescent City. I’m in Waldport, right in the middle of the central Oregon Coast.